I am grateful to all the men and women who shared their stories and memories with me. It is to all of them and those who did not return from the war that I dedicate this program. With the exception of a handful of interviews, all the interviews occurred during POW reunions such as the American Defenders of Bataan & Corregidor Conventions; the Mukden Reunion and the U.S.S. Canopus reunion. My interest in this subject arises from being the daughter of a prisoner-of-war. My Dad, Robert Thompson, was a Pharmacist Mate on the U.S.S. Canopus. The Canopus crew scuttled her just before the surrender of Bataan. 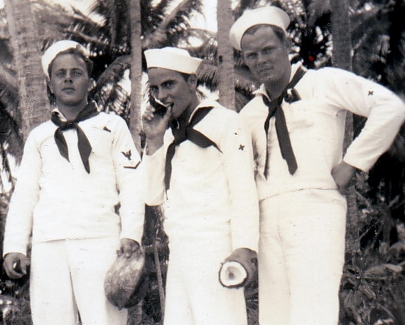 The sailors escaped to Corregidor Island. My Dad was surrendered to the Imperial Japanese on May 6, 1942 and was a POW for three and half years. My Dad would never openly speak about his POW experiences even though my two brothers and I desperately wanted to know what he went through. It wasn't until I attended the 1992 ADBC Convention with my parents that I started to learn his story. When I left that convention I decided to try and "tell" my Dad's story. Well, after nearly 20 years it hasn't become my Dad's but the stories of many of the individuals caught in this tragic situation. Tell us about your hero from this conflict. Share a personal story that happened to your hero in your own words and we will place them on the Wall of Heroes. The purpose of the Wall is to pay tribute to the men and women who fought the Imperial Japanese during the early months of World War II. The story must have occurred between Dec. 7, 1941 and May 7, 1942 in the Philippine Islands, Wake or Guam. If possible include a photo of this person from that time period. Consider joining the Descendants Group if you have an interest in this period of history and what happened to those that became POWs. Their mission is education and to continue to remember this time in history. It is not necessary to be a descendant of a POW to join. The annual conventions feature former prisoners–of–war who share their stories with the members. The link below will take you to the Descendants Group website for further information.